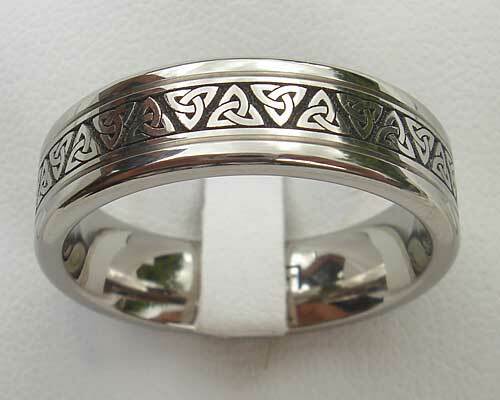 Trinity Celtic Knot Titanium Ring : LOVE2HAVE in the UK! 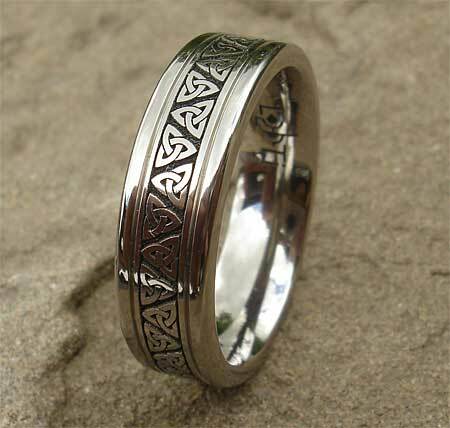 Another of our titanium rings featuring the Celtic Trinity Knot symbol. The laser engraving is repeated and reversed on itself all the way around the outer. The Celtic Trinity knot design symbolises the never-ending infinity of eternity in nature. It has very spiritual overtones of beginnings and endings and is often used to signify good luck and good health to the owner of the ring. This ring is the same model type listed in the titanium rings section as the pattern is flanked by two outer rails on either side separated by fine grooves.